Whoa, Apple just sued HTC for infringing on 20 patents "related to the iPhone's user interface, underlying architecture and hardware." UPDATE: The patents Apple's claiming are incredible. We've got both full filings below. 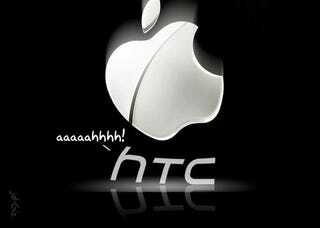 And HTC's comment. They're surprised too! We are not a party to this lawsuit. However, we stand behind our Android operating system and the partners who have helped us to develop it. Update 3 John at Digital Daily's got the ITC filing against HTC as well (which we've now got embedded as well). It lists the 10 other patents Apple's suing over, and spells out all the phones at issue—which looks like basically every Windows Mobile and Android phone HTC makes, from the G1 to the HD2. Nilay at Engadget notes, crucially, that while Apple names a whole bunch of HTC phones, the phones they call out repeatedly as infringing on specific patents are Android phones (the WinMo phones are called out for containing a DSP chip, not for anything WinMo related). Meaning that the bigger issue could be with Android itself, and Google, though it's not exactly clear yet. Also, Nilay's got a solid patentese-to-English breakdown for all of the patents Apple's claiming, like what exactly a patent on "Time-Based, Non-Constant Translation Of User Interface Objects Between States" means. We only learned of Apple's actions based on your stories and Apple's press release. We have not been served any papers yet so we are in no position to comment on the claims. We respect and value patent rights but we are committed to defending our own innovations. We have been innovating and patenting our own technology for 13 years. Update: Apple's asking for a permanent injunction, which would bar HTC from importing or selling phones here that use these patents, along with triple damages with maximum interest (read: a lot of money). As you can see, some of the patents are fairly broad, like "unlocking a device by performing gestures on an unlock image," which seems to cover like every touchscreen phone ever. Here's a gallery of the full suit, followed by a breakout of the patents. Notably not among them? Anything pertaining to multitouch. The ‘331 Patent, entitled "Time-Based, Non-Constant Translation Of User Interface Objects Between States," was duly and legally issued on April 22, 2008 by the United States Patent and Trademark Office. The ‘949 Patent, entitled "Touch Screen Device, Method, And Graphical User Interface For Determining Commands By Applying Heuristics," was duly and legally issued on January 20, 2009 by the United States Patent and Trademark Office. A copy of the ‘949 Patent is attached hereto as Exhibit B. The ‘849 Patent, entitled "Unlocking A Device By Performing Gestures On An Unlock Image," was duly and legally issued on February 2, 2010 by the United States Patent and Trademark Office. A copy of the ‘849 Patent is attached hereto as Exhibit C.
The ‘381 Patent, entitled "List Scrolling And Document Translation, Scaling, And Rotation On A Touch-Screen Display," was duly and legally issued on December 23, 2008 by the United States Patent and Trademark Office. A copy of the ‘381 Patent is attached hereto as Exhibit D.
The ‘726 Patent, entitled "System And Method For Managing Power Conditions Within A Digital Camera Device," was duly and legally issued on July 6, 1999 by the United States Patent and Trademark Office. A copy of the ‘726 Patent is attached hereto as Exhibit E.
The ‘076 Patent, entitled "Automated Response To And Sensing Of User Activity In Portable Devices," was duly and legally issued on December 15, 2009 by the United States Patent and Trademark Office. A copy of the ‘076 Patent is attached hereto as Exhibit F.
The ‘105 Patent, entitled "GMSK Signal Processors For Improved Communications Capacity And Quality," was duly and legally issued on December 8, 1998 by the United States Patent and Trademark Office. A copy of the ‘105 Patent is attached hereto as Exhibit G.
The ‘453 Patent, entitled "Conserving Power By Reducing Voltage Supplied To An Instruction-Processing Portion Of A Processor," was duly and legally issued on June 3, 2008 by the United States Patent and Trademark Office. A copy of the ‘453 Patent is attached hereto as Exhibit H.
The ‘599 Patent, entitled "Object-Oriented Graphic System," was duly and legally issued on October 3, 1995 by the United States Patent and Trademark Office. A copy of the ‘599 Patent is attached hereto as Exhibit I. The ‘354 Patent, entitled "Object-Oriented Event Notification System With Listener Registration Of Both Interests And Methods," was duly and legally issued on July 23, 2002 by the United States Patent and Trademark Office. A copy of the ‘354 Patent is attached hereto as Exhibit J. "We can sit by and watch competitors steal our patented inventions, or we can do something about it. We've decided to do something about it. We think competition is healthy, but competitors should create their own original technology, not steal ours." Sound familiar? Of course it does, because Nokia's being accused of the same thing, and Apple had similar nasty comments for Palm as well, though they haven't led to a lawsuit (yet). We're digging up what exactly HTC is in trouble over, with Apple merely stating it's related to the "iPhone's user interface, underlying architecture and hardware." However, it's worth noting Apple won a fairly huge multitouch patent just a couple of weeks ago, and now they're nailing HTC for twice as many patent infringements as they busted Nokia on in that countersuit. Apple's original set of iPhone interface patents were actually fairly limited when you drill down, but we'll see pretty shortly what, precisely, they're suing HTC over. Which should give us a pretty good idea of whether or not this just the first of many lawsuits, since HTC's not exactly the only other multitouch game in town. CUPERTINO, Calif. March 2 /PRNewswire-FirstCall/ — Apple® today filed a lawsuit against HTC for infringing on 20 Apple patents related to the iPhone's user interface, underlying architecture and hardware. The lawsuit was filed concurrently with the U.S. International Trade Commission (ITC) and in U.S. District Court in Delaware. Apple reinvented the mobile phone in 2007 with its revolutionary iPhone®, and did it again in 2008 with its pioneering App Store, which now offers more than 150,000 mobile applications in over 90 countries. Over 40 million iPhones have been sold worldwide.